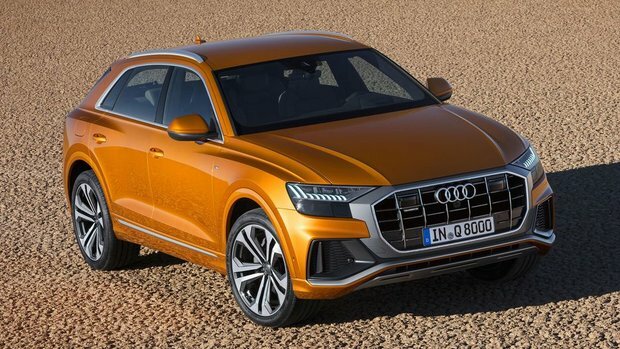 The German automaker recently revealed its latest foray into the coupe SUV world with the all-new Audi Q8. Sleek in design and technology, the Q8 is Audi’s answer to the Mercedes GLE Coupe and the BMW X6. Sexier to look at and much more fun to drive, the Audi Q8 slots nicely into the automaker’s lineup and has plenty on offer. For starters, the look of the Audi Q8 is one of style and sophistication. A stunning silhouette from any angle, the Q8 boasts modern lines, with a muscular stance and a high shoulder line. Linear headlights and taillights ensure the Audi Q8 is instantly recognizable on the road, and gives it a decidedly futuristic look, as well. It can even sit atop 22” wheels if you so desire. Inside, the same modern flare exists with multiple easy-to-navigate screens in the centre stack and in the gauge cluster. Both centre stack screens are touchscreen and full colour, and there are a limited number of knobs, but that only adds to the overall sleek, concise look of the interior. One of the Audi Q8’s coolest technology features is the way in which the voice command system responds. Instead of having to learn specific phrases to make the car listen to you, you can simply have a conversation with it. For instance, if you’re cold, simply press the voice command button and say “It’s getting chilly in here.” The car will then ask you what temperature you’d like to set in the vehicle. There’s seating available for 5, thought four full-grown adults will likely be most comfortable. Ample head room and legroom in the rear and up front will keep all satisfied, no matter how long the road trip. And you’ll want to road trip in this coupe-like SUV, thanks to Audi’s engineers who outfitted the Q8 with a turbocharged 3.0L V6 that produces 335 horsepower and 369 lb-ft of torque. In European markets, a hybrid system will allow the V6 to turn off at certain speeds and have the Q8 run on battery power alone, however, stateside that system will act only as a start/stop system when the car is idle. Power is sent to all four wheels, and is controlled via an 8-speed automatic transmission. The all-new 2019 Audi Q8 pricing has yet to be revealed, but you’ll want to head down to your local Glenmore Audi to speak to one of our experts about this brand new flagship SUV. And don’t forget to sign up for a test drive when they hit dealers later this year.